Our standard American diet is sad; sad because its consumption is making us sick. Rates of cancer, diabetes and heart disease, as well as obscure diseases and behavioral problems in children are higher than ever. Theories of healthy nutrition come and go, which only adds to the confusion about what we should eat to be healthy. The food industry loves this because then we all just throw our hands up and say…”everything is bad for you.” This is just not true. While sifting through all the claims and advice is not easy, when you use common sense and diligence, the truth emerges. Fortunately we have the work of Weston A Price to show us what people who were truly healthy ate. Dr. Price identified 14 groups of disease free people. If we look at the diets of these hearty people we see they had similarities with each other but were very different to how we eat today. These common factors helped them build strong bodies that resisted disease. Here are the 9 common characteristics of these life sustaining diets. Compare them with how you eat – could there be a correlation with your own aches, pains, tooth decay and other health problems? The answer is yes. 7. Preparation methods included cooking, soaking, sprouting and fermenting and some animal foods were consumed raw (milk and meat). 9. All cultures used animal bones, usually to make bone broths. These people ate REAL food they took time to prepare with love and care. And that food became their bodies through digestion and assimilation. Are you eating REAL food? Think it might be time to? If you see this as possible in your life, good for you, because it is. 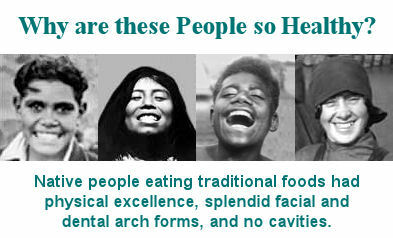 Large numbers of people are healing themselves by returning to traditional diets. The Weston A Price Foundation website is a wonderful resource. Each of the above issues will be addressed in detail in future articles on this blog.